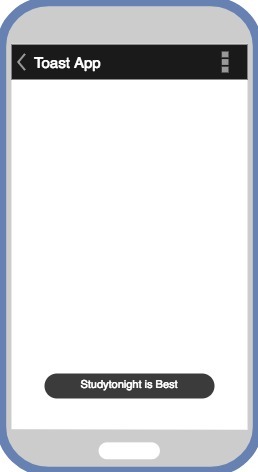 Have you ever encountered the following format of message as shown in the image below in any app you use? This is called a Toast in Android. 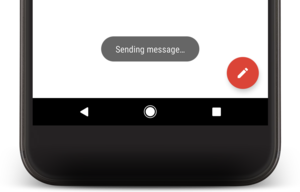 It is used to display short and temporary messages in android apps. So let's first see what are its features and then we will get our hands dirty and learn how to make such toasts. It is an Android widget that is used to show a message for a short duration of time. It disappears after a short time. It doesn't block the Activity or Fragment when it runs. It can be used to give feedback to the user regarding any operations, like form submission etc. How to Create a Toast? 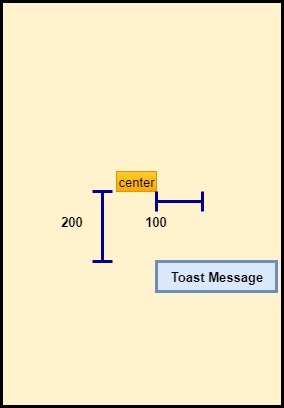 A Toast can be created using the android.widget.Toast class, which extends the java.lang.Object class. Before, we proceed with learning how to create a Toast, let's spend some time in exploring the android.widget.Toast class. public static final int LENGTH_LONG This can be used to display the Toast for a longer duration. public static final int LENGTH_SHORT This can be used to display the Toast for a longer duration. The constant LENGTH_LONG sets a display duration of 3.5 sec while the constant LENGTH_SHORT sets a display duration of 2 sec for the Toast. Following are the methods available in the Toast class, which are used to create a Toast. public static Toast makeText(Context context, CharSequence text, int duration) This method makes the Toast widget with the specified text and for the specified duration. public void show() This method shows the Toast. Make an object of the Toast class. Call makeText(Context c, CharSequence text, int duration) method which needs three parameters. CharSequence text: This is the message which is shown in the toast. It can be any text. int x: You can use this to set the horizontal distance. From where this distance will be measured depends upon the int gravity parameter you have set. int y: You can use this to set the vertical distance. Again, from where this distance will be measured depends upon the int gravity parameter you have set.